Some time ago I had a post entitled: “Being on-Purpose is Inspiring to Others.” I talked about some inspiring people who are “on-Purpose.” I even linked the idea to another post “Transcending and SQ” but I didn’t say how! Yet, when a person contemplates questions of “ultimate importance,” such has a need to forgive ourselves, or others who seem unkind or even angry at something, we say in “good faith,” a little body in the centre of the brain, lights up the whole brain. So, SQ or spiritual considerations can be said to take in other factors than the mundane or pragmatic. One example is the inclusion of beauty in our considerations. In my spiritual training, I learned that beauty was the expression of Truth. Truth is made up of design and control. For example, if we say a rose is beautiful, it appears to have a special design, under the control of chemicals of which it is composed. If we interfere with the chemical control by spraying acid on the rose, it quickly looses its beauty. This principle works with people, too. If we can see beauty in a person, we are observing that the person is expressing their self according to their inherited design and control. However, the beautiful person also has some spiritual capacities to express. We could say they are spiritual beings, operating in a physical body. So their SQ gives them the capacity to inspire and be inspired. After all, the word “inspired” is defined as being filled with spirit. Nevertheless, this capacity shouldn’t be left to chance, because we humans are free to choose. Hamlet said: “To be or not to be? That is the question.” I believe, as spiritual beings, we have a responsibility to inspire and be inspired. This is the ultimate question that turns on our whole brain! I observe people frequently compromising their beauty because their expectations are not met. This gives me a chance to silently forgive people who are disappointed that others are not living up to their expectations. Personally, I find this strategy inspiring, especially if I can find a way to say something that is empathic, because that can lead the person to explore their situation and find a satisfactory solution for themselves. I wish you a Happy 2014, because to inspire or be inspired, that is really the question! Previous Previous post: PERMA is an Acronym in Large Inspiring Communities! 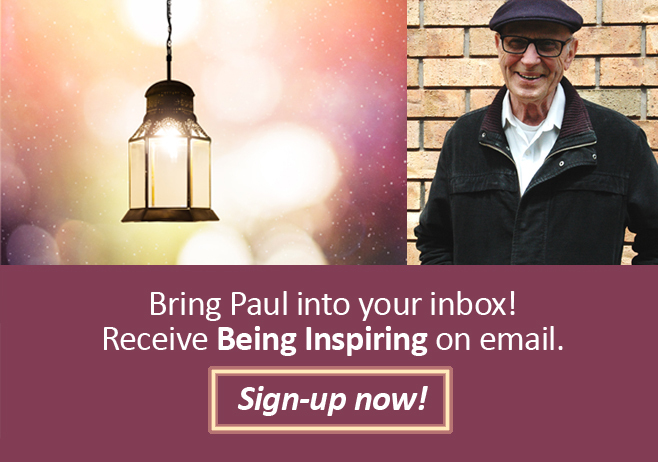 Next Next post: Spiritual Beings are Already Inspired!